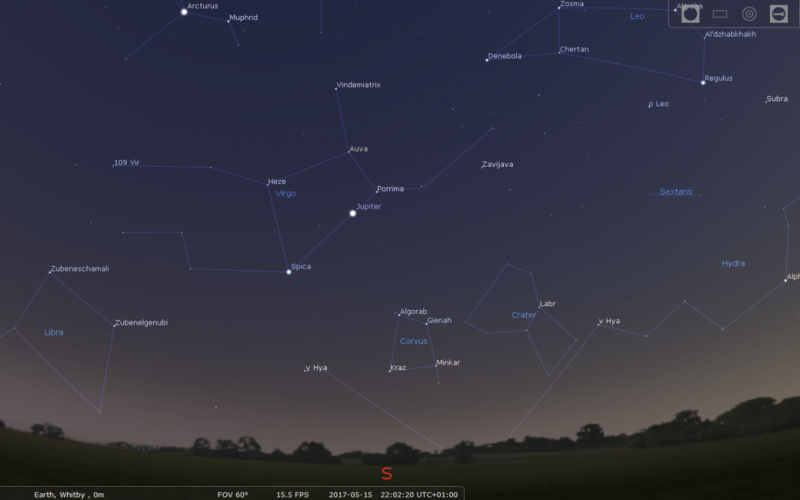 Mars finally succumbs to the encroaching evening twilight and by the end of the month is lost in glare. 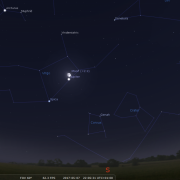 The Moon lies nearby on the 27th. This leaves Jupiter as the dominant planet in the evening sky. 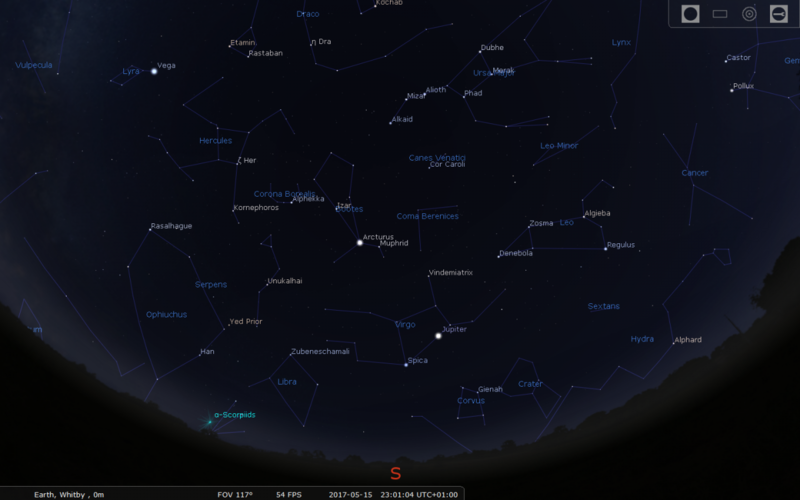 Look for the king of the planets low to the SE as May commences and further round to the south by the month’s end. It resides a little distance above the chief star of Virgo: Spica. Jupiter is an unmistakeable object and a splendid sight in any telescope. 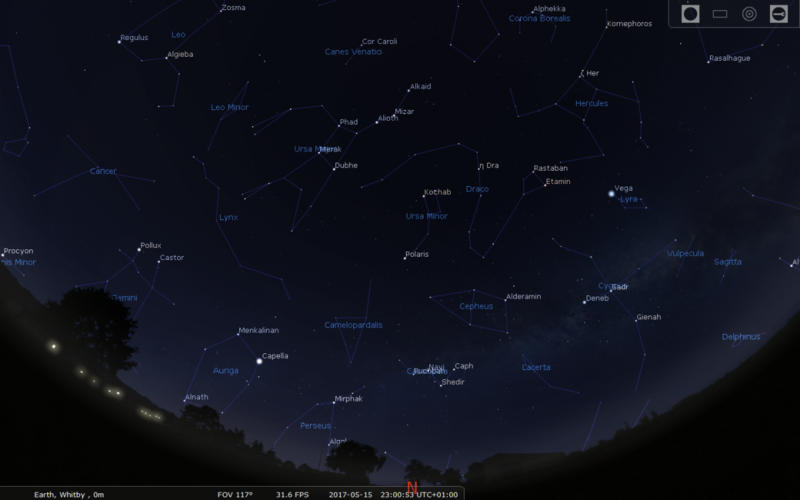 Look for the belted disk and Galilean moons; specks of light visible in line with the equatorial plane. The configuration changes each night, even over the course of an observing session you can see a discernable change in position. 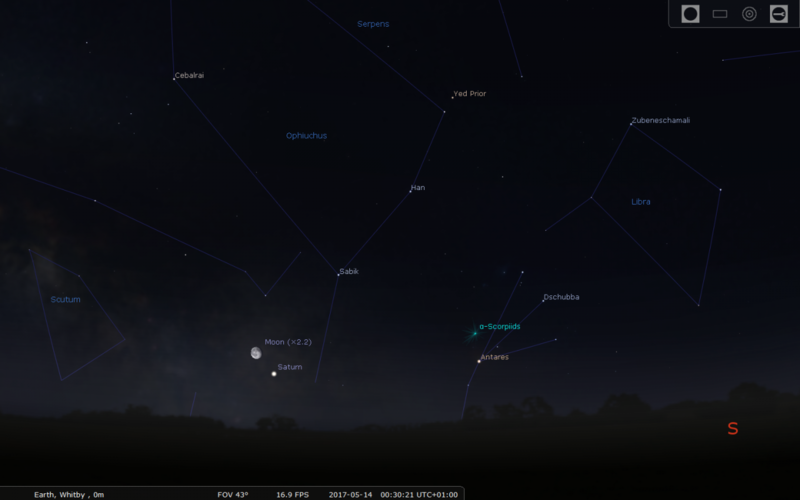 The Moon lies nearby Jupiter on the 7th. 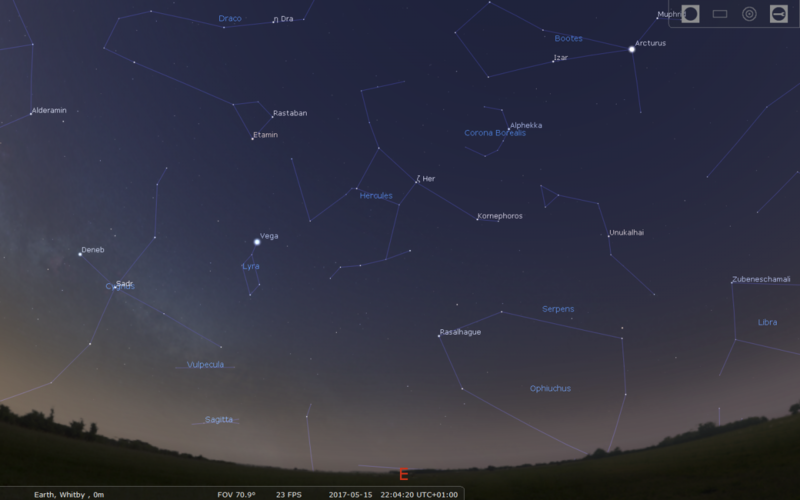 Saturn rises shortly after midnight at the start of May, but is visible low in the SE by 23:00h by the end of the month. 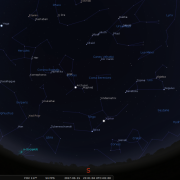 By the 19th Saturn moves from Sagittarius into Ophiuchus. A view of Saturn’s glorious ring system is not soon forgotten, and a modest telescope will reveal them easily, especially as they are favourably orientated to earth right now. The only down side is the altitude of Saturn in the sky, which for the next few years is low to the south, which means air stability and clarity will not be at its best. Patience is therefore required to catch those moments of ‘good seeing’. Careful observation should reveal a speck of light close by Saturn, this is Titan, Saturn’s major moon. It is worth noting that the NASA probe - Cassini, which has been at Saturn since 2004, is about to undertake a series of orbits between the rings and the planet itself, so keep an eye on the media for some spectacular images. 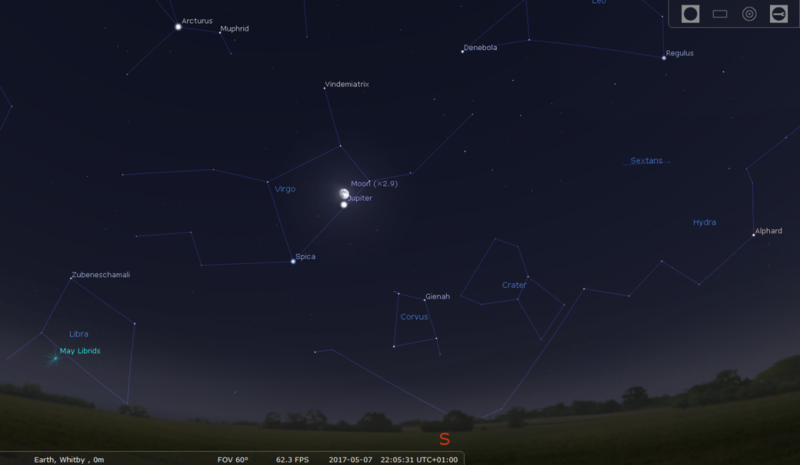 On the 13/14th The Moon rises just ahead of Saturn down in the SE. 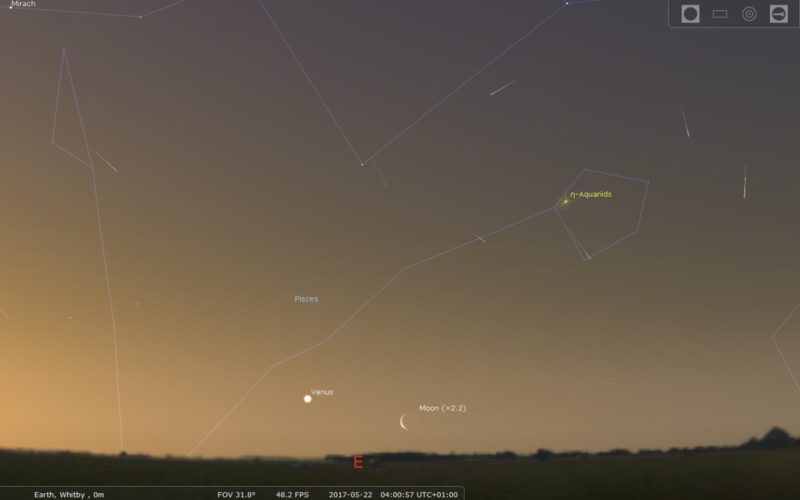 Finally Venus is visible low in the dawn sky across in the east. 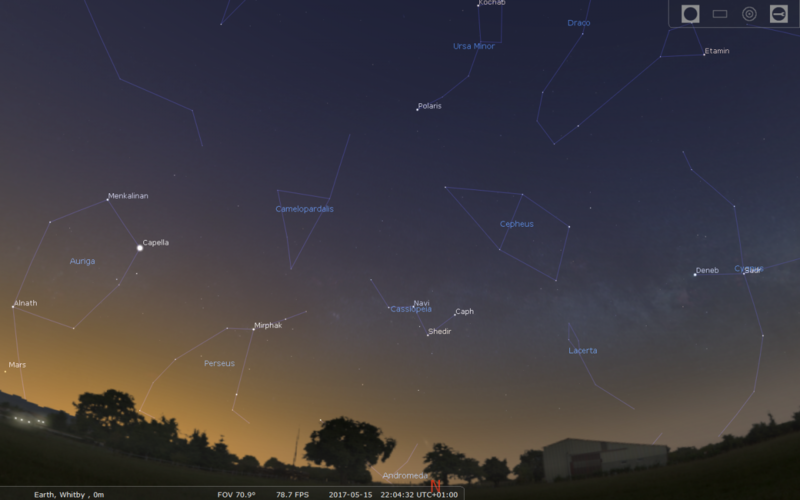 View on the 22nd when a crescent moon lies off to the right of Venus, which will also exhibit a half phase, a pleasing view to greet the new day. 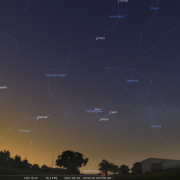 If you are an early riser look out for some shooting stars around May 5/6th when the Eta Aquariid meteor shower reaches a peak. This is one of two meteor showers associated with debris particles deposited over time by comet Halley, the other shower being the Orionids seen in late October. Eta Aquarids have a ZHR (zenith hourly rate) approaching 30, but with Aquarius only just rising in the SE shortly before dawn, observations from the UK are restricted. The radiant of the shower lies close to Eta Aquarius, one of the stars making up the "water jar" in the otherwise faint constellation of Aquarius. The Moon will have set by early dawn, so observing around 04:00h (before twilight becomes too bright) should yield some meteors. Orbiting the Sun every 5.4 years, this was the closest approach by comet TGK in our lifetime and as such should have been readily visible through binoculars during early April reaching magnitude + 6.5. 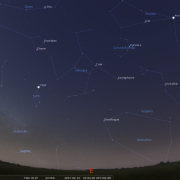 Some members did in fact look for the comet after the April meeting, however moonlight hampered observations and a positive sighting could not be confirmed. For the next two weeks strong moonlight interfered, however in the wee small hours of April 26th (02:00h) Mark did finally track down 41P. 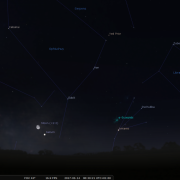 An interesting fact was that the comet was not located where Stellarium or many of the internet charts had it placed for that set date - as mark had suspected. 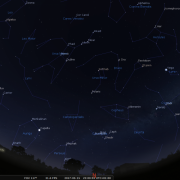 Starry night pro plus (the planetarium program the society use) had been accurate. The comet appeared as a small, subtle fuzz ball. No tail was apparent visually. Comet 41P is now heading downwards along the left-hand side of the Keystone in Hercules, before passing to the right of Vega in Lyra. 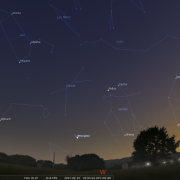 Discovered in November of 2015, comet V2 should be well placed for northern hemisphere observers at a decent altitude throughout the spring and early summer months. 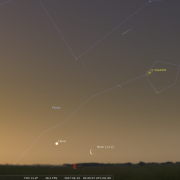 The comet reaches perihelion on June 11 when it will be 1.63 AU from the Sun and 0.8 AU behind the Earth. 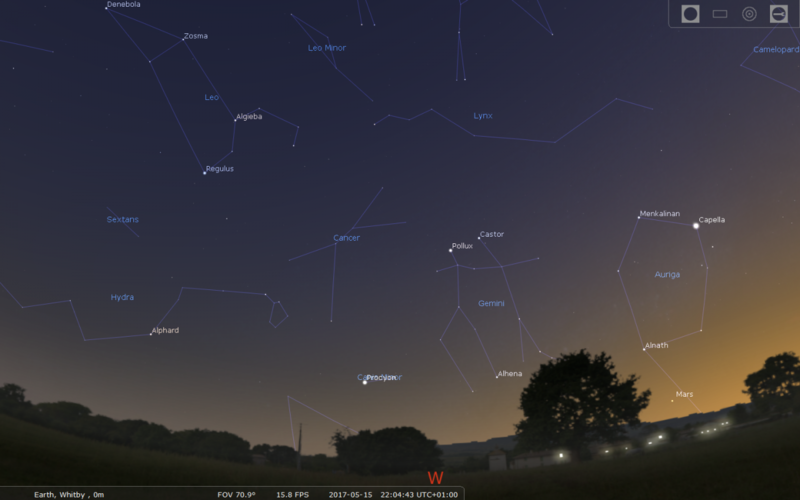 The comet should become a fairly easy binocular object by May until early July peaking at mag+6 in late June. From January until mid-June C/2015 V2 (Johnson) will either be in Boötes or north-western Hercules. 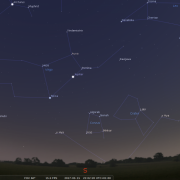 As it plunges south during June, it passes just five degrees east of the brilliant star Arcturus on the third of the month.